Flappers are underwater, mussel-like foes that appear exclusively in Donkey Kong Land. They commonly dwell the second world, Kremlantis, and return in numerous other underwater areas of the same game. When attacking, a Flapper claps its mantle together and propel itself upwards. After it reaches a point high enough, it slowly begins to sink. If a Kong touches this enemy while it is moving through the water, he gets injured and passes out. Flappers are often encountered in groups and swim in tight spaces to increase difficulty. 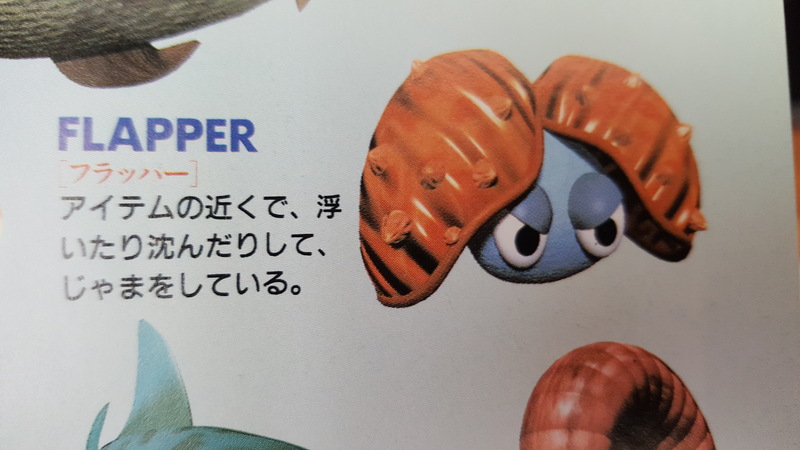 None of the English Donkey Kong Land-related material refer to Flappers as such or give them a proper name. However, they are repeatedly described as sea creatures in issue #74 of Nintendo Power. This descriptor is not used for other aquatic enemies found in the game. Furappā Flapper; Officially romanized as "Flapper". This page was last edited on January 24, 2019, at 04:41.